The Kandy Cultural Show and the Temple of the Sacred Tooth ceremony have become tourist fodder that many travellers would find low-brow. Here's our take on these Sri Lankan extravaganzas. The Kandy Cultural show and Temple of the Sacred Tooth ceremony are very touristy and tourists get a lot of bad press these days. Accused of wanting to see some of the world’s greatest sights, their endless thirst for ticking off the bucket list has landed them in travelling shame. They eat familiar food, travel in bus groups and collect tacky souvenirs. Much better to be a traveller; the non-tourist who refuses to see anything listed in a guidebook, immerses themselves in culture and regularly engages with locals. But refusing to see the world’s greatest sights because they are popular feels a bit like a toddler who refuses to play with his favourite toy because his little sister touched it. Sometimes it pays to brave the crowds and tourist tack. But is the Kandy Cultural Show and Temple of the Sacred Tooth ceremony traveller bliss or tourist hell? Kandy is the cultural capital of Sri Lanka and a must on any 10-day Sri Lanka itinerary. It sits at the foot of the highlands, is surrounded by rolling tea fields and is the beginning of one of the greatest train journeys in the world. There are plenty of things to do in Kandy as well as numerous day trips like having breakfast with elephants, but the iconic sights of Kandy are the much visited Temple of the Sacred Tooth ceremony and the Kandy Cultural Show. The Kandy Cultural show is held in what looks like an indoor netball stadium of a local public school. Tourist touts offer to guide us to the venue, even though we are standing right in front of it. Once inside we run past an influx of bus groups wearing their “I love Sri Lanka” t-shirts to grab some seats. The front 40 seats are reserved for some people that never turn up. The hall is filled with anticipation thanks to the traditional Sri Lankan music blaring out of low-quality speakers, waiters offering refreshing Sri Lankan snacks, and hundreds of tourists who have no idea what’s about to happen. The Kandy Cultural Show is a celebration of Kandyan dance, an energetic series of manoeuvres – all performed to various forms of mesmerising percussion. It’s a bit like high energy land-based synchronised swimming performed by smiling locals with good balance and a knack for twirling objects. The performers wear a colourful display of elaborate costumes in the form of beads, tassels, and sparkles, gyrating to the rhythmic sounds of traditional Sri Lankan drumming. The beat comes from the Geta Beraya, a drum only used in Kandyan dance, which appears to warrant its overuse. The outfits are topped off with gravity-defying headgear which can only be worn by males. It’s all pulled together as fit Kandyans perform vigorous hand movements and impressive backflips over the course of the next hour. Despite what TripAdvisor might tell you, the Kandy Cultural Show is a great show. It’s a celebration of everything that makes Sri Lanka a fantastic place to visit. Bright, energetic entertainment that will have both tourists and travellers reaching for their smartphone to capture the swirling fabulousness. The event is topped off by the more experienced dancers swallowing fire and walking – barefoot – over some flaming BBQ briquettes. I’ve never really understood fire walking, and I still don’t. But, standing there sipping our sweet Sri Lankan tea while watching these performers entertain the crowd with the earnestness of an amateur theatre production, I couldn’t help but smile. Kandy Cultural Show / 1700 – 1800; Location: Kandy Lake Club 7 Sangamitta Mawatha, Kandy; Cost: Rs1,000 per person. After being thoroughly entertained at the Kandy Cultural Show, the next stop is the nearby Temple of the Sacred Tooth ceremony. A more sombre celebration of Sri Lankan culture. Located in the royal palace complex, this impressive temple is surrounded by a brick moat, topped with a massive golden canopy. The tooth is said to belong to Siddhārtha Gautama, Buddha himself. When he was cremated in India, one of his teeth was recovered and made its way to Sri Lanka where it was presented to the king. Over the centuries the tooth was handed down to each subsequent king who built temples– usually close to the palace – to house it under protective custody. As Kandy was the last of the ancient capitals, it remains here today. Attending the ceremony involves paying the Rs1500 entrance fee – relatively expensive by Sri Lankan standards. Entrance is free for locals, making you feel more like a tourist if you didn’t already. Once inside, you arrive at the impressive entrance hall. A large space with stunning gold frescoes on the walls and very intricately carved wooden columns. It’s a beautiful space. The ceremony begins with billowing incense, beating drums and mingling families – dressed in their good-going-out-clothes. It is a noisy atmospheric affair so very different from religious ceremonies of my youth. You may even feel like a proper traveller. But like a jolt of reality, you soon find yourself queueing up along a staircase, not really sure what you’re queueing for. After a short wait the queues winds its way up the staircase, enters the sacred area where the tooth resides. Next we shuffled past the tooth to pay our respects in a brisk, time-controlled manner. We don’t actually get to see the tooth; it’s encased in seven gold caskets. When it was my turn to approach the tooth, I lent in slightly to admire the beautiful gold caskets, ready to observe their intricate magnificence. I don’t think I even came to a complete stop before I was tapped on the shoulder by someone in a smart uniform and told to move on. I stepped aside, not sure if the ceremony had happened to me or not. While there’s not much to the actual ceremony, the smoke filled, drum banging temple is very atmospheric and watching the locals clearly moved is reward enough to cover the entrance fee. After the ceremony, we wandered around the other rooms detailing the story of Buddha, before making our way out to the courtyard where more incense fills the air, candles light up the sky and gifts of flowers remember those gone before us.. So, forget the stigma attached with being a tourist for one glorious night and bask in the goodness that is the Kandy Cultural Show and the Temple of the Sacred Tooth ceremony. You’ll be glad you did. Another unmissed experience whilst in Sri Lanka is enjoying spectacular views from their timeless trains. For a glimpse into the royal past of Sri Lanka, check out our cycling tour of Polonnaruwa. For more historical reading, check out our roam page here. I know, I was hoping we’d see the actual tooth as well! Oh well, still a great experience. I’m jealous you haven’t been to Asia, you have so many amazing experiences to look forward to! We highly recommend Sri Lanka and Kandy, such an interesting part of the world. It was certainly a very interesting experience. Thanks for stopping by Anisa. It’s a great place. You might have to go back! This seems very similar to the debate whether to attend a Luau while in Hawaii. I think these celebrations of local culture are crucial; in some cases, they are the only opportunity to witness and begin to learn about these cultural traditions. I also think the Kandy Cultural Show looks awesome! 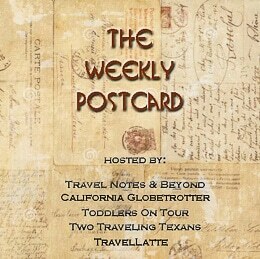 We hadn’t heard of it, and are glad you shared this with us on #TheWeeklyPostcard. I agree, they are a great way to interact with the local culture. It was lots of fun too!